2) The animal washing machine broke down. So for two weeks we had to hang up the dirty laundry on the washing line and hose it. Clean and hygienic? Surely not! But through all this and the less privacy, just one bath and one oven for cooking we managed not to stand in the way of each other and had a lot of fun. Especially on the days off it was always great to have another person to do things with on this beautiful island. Rarotonga is one of the best places to spend your free time when you like the sea and the beach. The days off are very important for you to get away from the clinic, otherwise it will “eat” you. But some weeks we had so less volunteers that we sometimes only had ½ day off a week, which was really exhausting, especially when you even can’t sleep some nights, because of the noises outside at the clinic. That’s how you really learn to get stress resistant, when you have a busy day after such nights. A busy day mostly already started with an emergency in the morning. 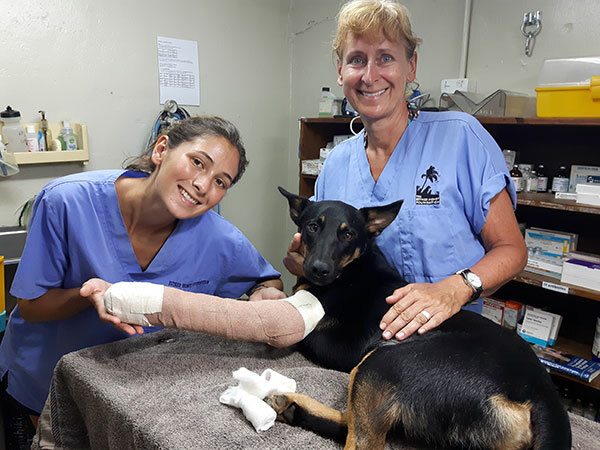 The emergencies on Rarotonga are most times dogs that got hit by cars or scooters. These cases also made my skills richer, because in Austria you don’t have many “hit by cars”. And so on we also had a few leg amputations, not only on dogs also on cats and goats. Another speciality of case is poisoning. Some dogs got poisoned, because of eating fish or eel at the beach, others got poisoned because of Paracord, a poison used in agriculture. The dogs then got poisoned by drinking out of a water puddle where this poison is in. The poisoning cases always needed a lot of care and it was great to see when the animals slowly recovered, but sometimes it was too late and it was a painful way to death. I will never forget the symptoms of these poisoning cases I saw, this will surely help me in the future to recognise poisoning better. In one case we ran out of fluids and so we tried this “myth” of using coconut milk as fluids and I can happily say IT WORKS!